It's the B-Side "Flower Hill" that grabs my attention on this Amy disc. Information about Central Park appears to be scarce to non-existent. To me, they sound like either a folk outfit from New York trying their hand at something a little bit more with the times or they're perhaps a studio creation. 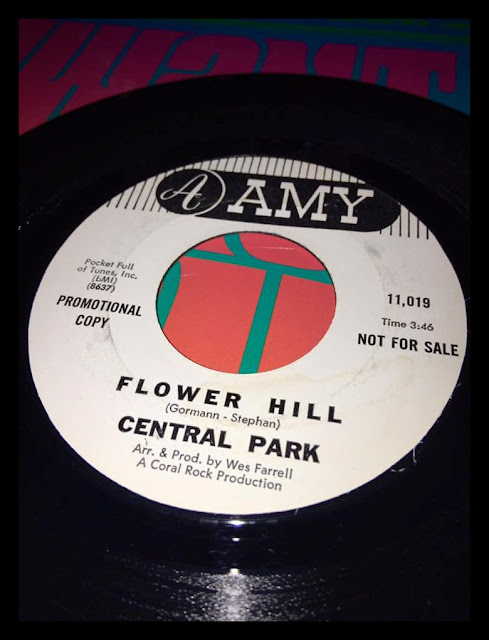 "Flower Hill" has double tracked vocals, guitars sounding like sitars, some studio FX and lyrics expressing the delight with the current scene of flowers, love and peace. This is radio friendly and safe. Not that this side would have got the plays because of it's flip side status. Producer and Arranger Wes Farrell went onto major success as a songwriter for the Partridge Family. How the heck has this one passed me by? Right up my alley, cheers.